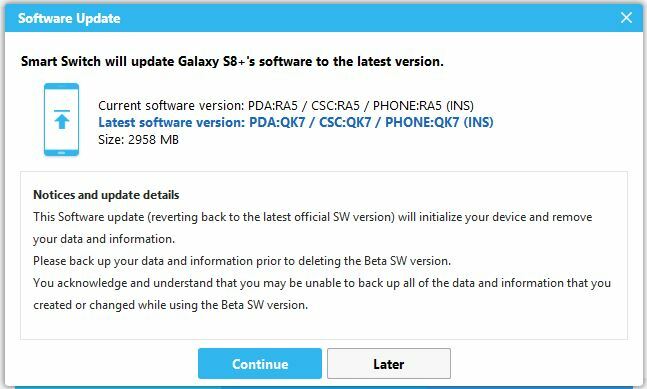 Samsung’s Galaxy S8 and S8 Plus Oreo beta program is finally over and a stable firmware rollout is expected in the coming weeks. Unfortunately, it seems that the excitement has led some users to download a bungled Smart Switch update that is inadvertently wiping all of their precious data. The misleading update, first spotted by a SamMobile reader, appears to be exclusive to the desktop version of Smart Switch. Rather than download the “latest version” as the software suggests, Smart Switch is instead rolling back Galaxy S8 and S8 Plus devices to an old Nougat build. The screenshot below shows the offending dialogue box based on an update for the International Galaxy S8 Plus variant in India (SM-G955FD). As you can see, the notice section does actually say that all data and information will be wiped during the rollback process. The problem lies in the fact that the notification is dressed up as a new update. With users anxiously waiting for Oreo to arrive, you could forgive anyone who happens to click that tempting “Continue” button without checking the finer details. Even stranger, the rogue update (build XXU1AQK7) isn’t even the latest version of Nougat available in India (that’d be build XXU1AQL5). There’s no word on whether Smart Switch is suggesting a similar update for other unlocked and international variants, but either way, it’s probably best to steer clear of the desktop app if you’ve been testing the Oreo beta. For all news on the official Android 8.0 Oreo update for Samsung Galaxy S8 and S8 Plus, be sure to follow our dedicated update tracker here.